These bracelets also look great stacked. Genuine Turquoise Rondelle Bead Bracelet for Men (On Stretch) 8mm beads AAA - 8"
The bracelet has45 Genuine Turquoise Rondelle beads each -8mm in size. It is beaded on HOT PINK stretch cord. 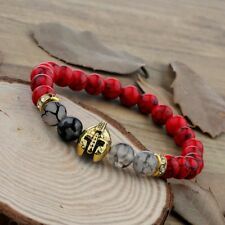 This bracelet has a nice look. Beads are doughnut shaped and more beads is better. This is a 8.5" handmade bracelet. It is made with turquoise and black beads with hairpin bone spacers. This strung on elastic for one size fits most. Bracelets Bangles. Is really beautiful and unique. Bracelet is strung on 1mm elastic cord and will fit wrist sizes from 7 1/2" to 8" (Item 6-17). It is best not to sleep in jewelry as body oils and chemicals can affect gemstones and non-gemstone jewelry. The bracelet is 21 cm long and the chain is 1 cm wide and the stone is 2.6 cm wide. We will give you an answer and give you the best price within 24 hours. Hi Friends. Material: 18K Gold Plated. Color: Gold Turquoise. Material: 18K Gold Plated. Color: Gold & Blue. Bracelets Size:Can adjust 6.5" to 7.5". Beads size:8mm. Genuine Turquoise Gemstone Bead Bracelet for Men (On Stretch) 6mm beads AAA - 8"
The bracelet has32 Genuine Turquoise Gemstone beads each -6mm in size. It is beaded on HOT PINK stretch cord. Bracelet is strung on 1mm elastic cord and will fit wrist sizes from 7 1/2" to 8". (Item 17-17). 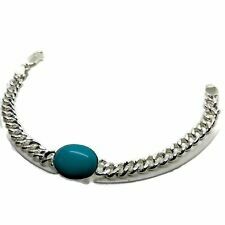 This is a common trade practice and should not detract from buying jewelry containing stabilized turquoise. Genuine Turquoise Gemstone Bead Bracelet for Men Women Stretch 6mm beads - 7.5"
The bracelet has30 Genuine Turquoise Gemstone beads each -6mm in size. It is beaded on HOT PINK stretch cord. 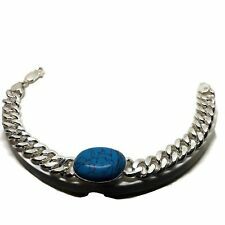 Men's Black Indian Head Turquoise Leather Bracelet USA Seller! 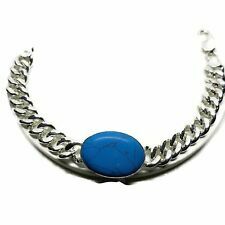 Blue Banded Turquoise Gemstone Bead Bracelet Men Women (Stretch) 6mm AAA - 7.5"